Six years ago when the Gold Line to Pasadena opened there was no Twitter. Today on the first day of revenue service for the new Gold Line Eastside Extension, L.A.’s first light rail to open since then, Twitter has become a global phenomenon. Angelenos are taking advantage of the technology to share their feelings about the extension in 140 character blips. I counted over 300 tweets referencing the Gold Line during yesterday’s grand opening and the tweets continue today as revenue service gets underway. spencergrammer This feeling of ennui is now replaced by the great celebration of the opening of the gold metro line downtown. mchangesq Gold line extension opens today! Now I can do a culinary tour of Olvera St., Chinatown, and Little Tokyo w/o ever hopping into a car. ChasingAmyLA Headiing out for our inaugural ride on the Gold Line! Here we come eses! cn8of10 About to get on the new East Los Angeles Metro Gold Line extension. My old neighborhood is growing up. rharristweet Off to the celebration of the East LA Extension of the Gold Line light rail. Expecting good food, music and multiethnic crowds. AreEezzy East LA Gold Line, I luv u! Prettyodd07 Had A Blast In East Los Angeles Thanks To the Metro Gold Line Extension…! rachelsurls Okay, I’m going completely nuts over the ELA Gold Line extension. I can’t help it. I will be able to ride from home to office. Awesome!!! alienbasenji Riding the new gold line extension. Being crowded in a shiny metal moving box has never been so much fun. Algernon90 I was at the gold line eastside extension and it was not so bad but it is cool. Asaliah_Vz Me gusto mucho la inauguracion del Metro Gold Line. frankyhernandez had a good time riding the gold line from downtown to east la. @Algernon90 was there as well. loved the underground part the most. WnksMeltMe New Metro Gold Line Extension looks sweet. That beats taking a bus any day. warrenacho and family had a great time riding the Gold Line into ELA last night. How exciting is the re-democratization of L.A. transportation! jody_beth Home from Gold Line Extravaganza ’09. The throngs of riders were terrific to see, not so much fun to experience firsthand (hi, I’m an INTJ). tako_door highlight of this weekend: rode the new Gold Line. sakocreative MTA gold line extension biggest FAIL ever! daroldhiga Oh my. The line to catch the new gold line runs the entire length of the station then doubles up in the parking lot. This…might take time. militantangleno today’s line for free rides on the Gold Line to Eastside is just as long as orig GL opening in ’03! r05ie Finally back home! Whatever you do don’t take the gold line today! It takes forever! There are thousands of people on it!!!! victoriabernal had so much fun @ the Gold Line opening in #dtla. Lines were sooo long, even but people still friendly, chatty & excited. 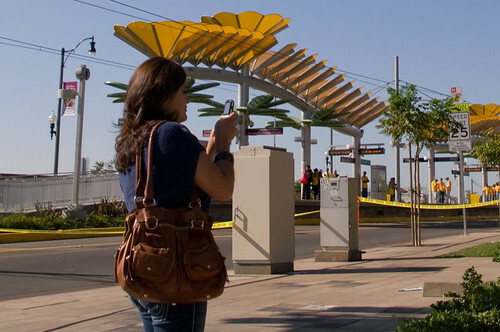 out4equality Los Angeles – The Metro Rail Gold line into East Los Angeles officially opened today. King Taco at Maravilla station. Woohoo! mchangesq Rode the Metro Gold Line extension from Union Station to Little Tokyo and back, and got a bite of Chashu Ramen and Gyoza at Daikokuya. BillLascher People were seriously worried about at grade safety for the gold line? It is beautiful and people aren’t stupid about a giant train. mikelava First Monday with the gold line extension. I wonder how many people are going to miss union station now that it’s not the last stop? Rossalincoln Mta promised gold line would be seamless from ela to pasadena. They lied. Rly annoyed. chadl2 Note to Metro riders. The Gold line eastside extension is running Board on the right at Union Station for Passadena, or end up like me. HLP90042 Just think. When the original Gold Line opened in 2003 there was no Twitter to share all the joy.